You don’t NEED nursing tops but they are very helpful, especially when you want to feel discretely in public. For years there weren’t many fashionable options for nursing mothers. There were only a few designs and they were all very obviously designed for breastfeeding. However, in recent years clothing designers and fashionable moms have worked wonders creating nursing tops that don’t look like nursing tops. Here are a few of my favorite styles of nursing tops for Fall. The Double V-Neck Nursing Top has a crossover styling at the bodice which is designed with invisible slits for easy and discreet nursing. The empire seam, shirring and long sleeves offer subtle details to create a stylish slimming fit. 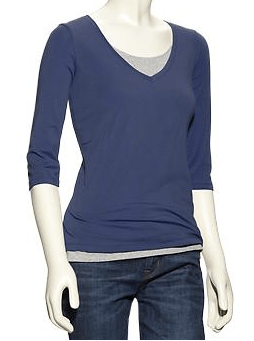 The Double-Layer Nursing T is a 3/4 sleeve knit jersey tee with attached interior tank for easy and discreet nursing. The Gathered-loop Nursing Top has fabric that flows down from the center gathering, skimming your stomach area. You can nurse easily and discreetly by moving aside the front fabric for breastfeeding access. The Drape Neck Top is a 3/4 length top made of modale and spandex. 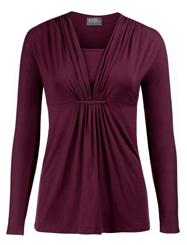 The double layer across the top allows you to nurse easily through the large drape neck. So many cute options for nursing tops, I love that many of these transition from maternity to nursing so you really get your money’s worth. Do you own or plan on owning nursing specific tops?